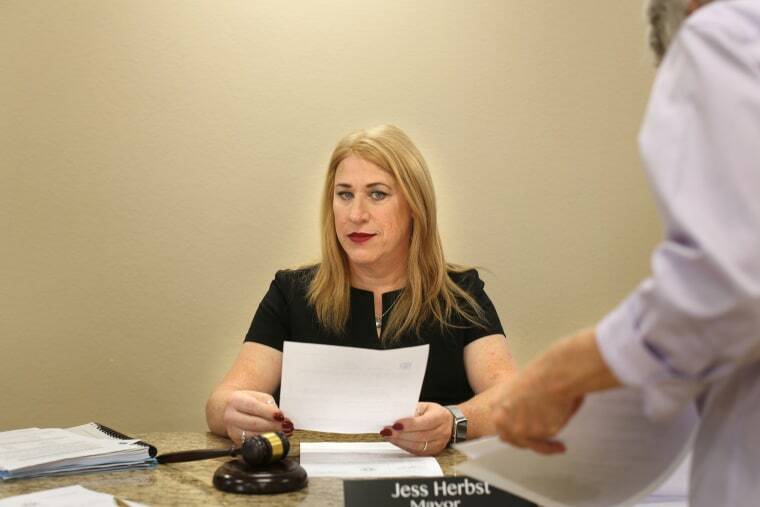 Jess Herbst thought she had a good shot of becoming the first openly transgender mayor to be elected in Texas on Saturday. She’d already served in the post for two years — a first in its own right — after the sudden death of the town’s former mayor. And she’d done things like re-establish the planning and zoning board and push for more law enforcement funding in the North Texas town of New Hope, population roughly 700. But after a bruising campaign, she lost, coming in third in a contest of four, Herbst said in an interview Monday. “I will work on your behalf to help address challenges, and to secure lasting and meaningful improvements to our quality of life in New Hope," she said. Herbst, who has never declared a political affiliation and said she has voted for Democrats and Republicans, is a computer consultant and former alderman, road commissioner, head of public works and mayor pro tempore. Elected by New Hope’s town council in May 2016, after Hamm’s death, she was then publicly known as Jeff Herbst. Nine months later, she published an open letter to the town revealing that she’d begun hormone replacement therapy two years before. “I know that transgender people are just coming to light in our society, and we have made great strides in the last few years,” she wrote, adding that her wife and daughters remained supportive. “I live my life as a female now, and I will be performing my duties to the town as such,” she wrote. The announcement — along with a campaign against the state’s “bathroom bill” — led to consistent media attention and a political profile that reached far beyond Herbst’s North Texas town. Constituents never criticized her in person, though commenters on the website Nextdoor used “basic transphobic slurs,” she said. And they grumbled that she was just using her position to seek fame. In one, for instance, a gay military veteran offered admiration for her political pursuits and said he’d love to move to New Hope. In the end, Herbst won 53 votes to Hamm’s 95, The Associated Press reported. A third candidate, Melissa Brown, came in second. A fourth candidate dropped out. Herbst said her sights were now set on a bigger prize — either the statehouse or the United States House of Representatives. “This is not the end of my political ambition,” she said.